The other day, a friend of mine asked what Dutch food I was going to be making for Easter. I had no idea. We ate chocolate and Easter dinners like pretty much everyone I knew. When I asked my parents, they said they ate a lot of eggs. A friend of theirs said that they would eat individual breads shaped like roosters before the Second World War, but that tradition fell away with the war shortages. I couldn’t even find anything in our Dutch cookbooks. So I turned the answer to all questions: the internet. The best I could find was a couple of bread recipes. One with a whole egg cooked on top of the loaf, and several versions of Paasstol bread—also made at Christmas and called Kerststol. 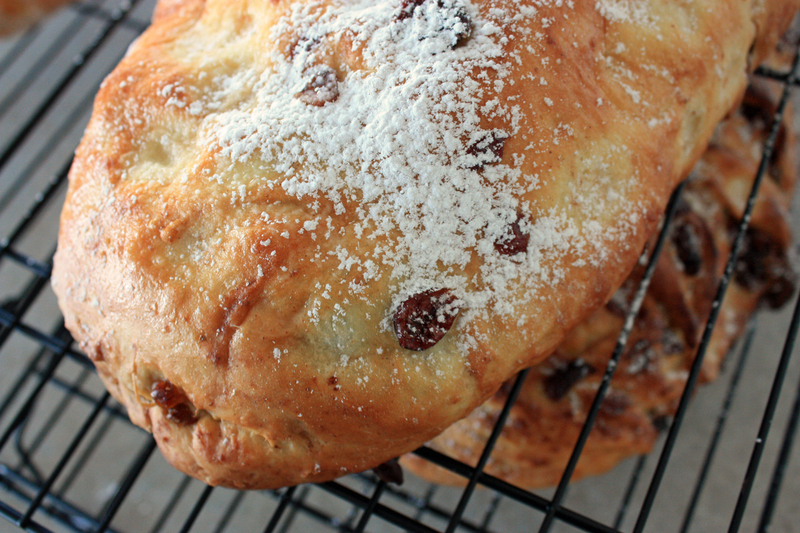 This bread reminds me of the raisin bread or rozijnenbrood with the addition of almond paste. My parents loved rozijnenbrood. 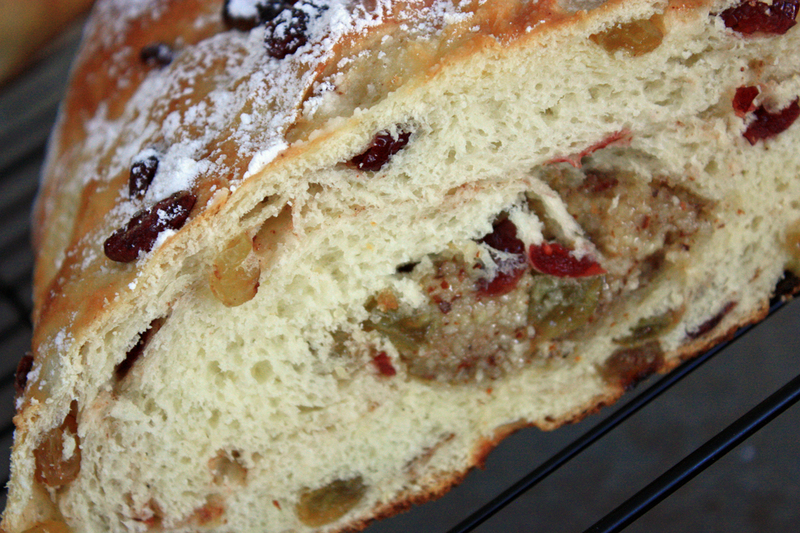 As we have established, I was an extremely picky eater and I would not touch raisin bread. I am also not fond of my English in-law’s Christmas fruit cake, although I do love the almond paste topping. This bread reminds me of that fruitcake in bread form, so perhaps my English family will appreciate this bread. These days, I am less picky, but filling a bread with dried fruit wouldn’t be my first choice. This Easter Sunday is my dad’s 75th birthday, and while I am making him a lovely vanilla and custard birthday cake, I thought I would experiment with Paasstol at the same time—since it can be about what he would like rather than about me. This bread can be made ahead of time and left to sit for a while because it will slice better. Slice it thick and spread it with butter. There are many varieties of the types of fruit and alcohol used. I was going to add walnuts too, but I forgot in the flurry of shaping the loaf. I combined this recipe from a few different places and ran into trouble when the bread recipe I was using clearly was short of flour, so let’s call this a first attempt. If my parents and in-laws like it, I will try again to make sure that this is a functional recipe. If anyone out there has any tips or recommendations to make this recipe better, I am happy to hear them. I doubled the recipe to make two loafs. 200 gm. almonds (pre ground or grind with food processor). Combine dried fruit, rum, and spices and let sit overnight. Stir occasionally. If you are making your own almond paste, combine all ingredients in a food processor and pulse until they combine into a soft paste. Shape into two one-inch diameter logs, cover in plastic wrap and refrigerate while you make the bread dough. 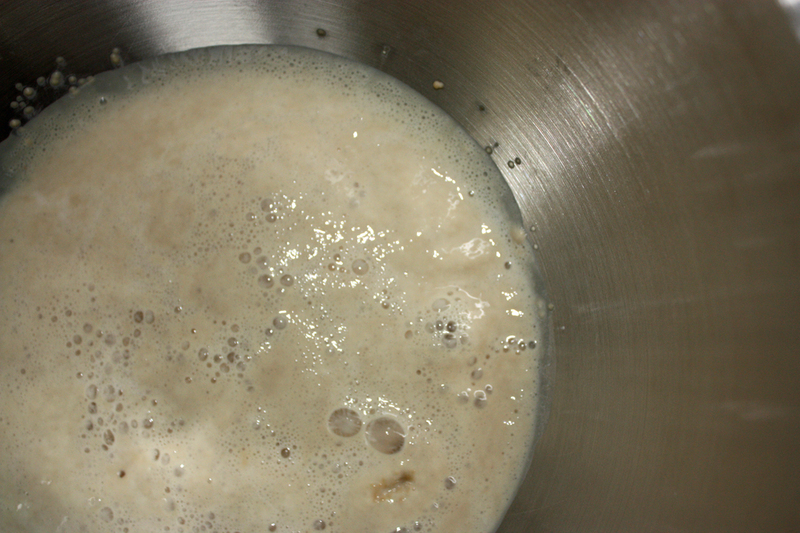 Sprinkle yeast over warm water and let sit for 10 minutes until foamy. Add half of the flour, sugar, salt and mix (by hand or with dough hook on mixer). Add milk, egg, butter and additional flour. Mix until smooth and slightly sticky dough. Knead for five minutes by hand on lightly floured surface or with a dough hook on mixer. Cover and let dough rise in a warm and draft free place for about 10 to 20 minutes. Drain any excess liquid from fruit. If you let it sit overnight, there likely will be none. Preheat oven to 350ºC. Line cookie sheet with parchment paper. Flatten out dough into a rectangle. Layer the fruit over the dough (some recipes call for you to mix in the fruit, which is what I did, but some of the fruit on the outside burned during baking, so next time, I will try leaving it inside). Place an almond paste log in the middle and shape dough around the log. Place loaf, seam side down, onto a cookie sheet and shape how you like. Cover loaf with plastic wrap and let rise for 30 to 40 minutes. Brush loaf lightly with water and bake for 40 to 45 minutes. Cool bread on wire racks. When cool to the touch, you can brush loaf with some melted butter and sprinkle with icing sugar. This looks so good! Thank you! Enjoyed the blog post on this bread. Like the option to keep the fruit inside. Watched MarthaStewart do similar. Did you take any pictures of it baked that way? No. I just made one loaf without any fruit and the one version with it rolled with the bread. I preferred it without fruit which is definitely not traditional.